Though the beginnings of Ethiopian Pentecostalism are fairly recent (e.g. in comparison to neighbouring Kenya), a considerable spectrum of Pentecostal and Charismatic churches has developed there, that presently includes all major Protestant denominations. These pages introduce a recent PhD project by Jörg Haustein studying the Ethiopian Pentecostal and Charismatic movements. Pentecostal and Charismatic Movements are on the rise in Ethiopia and account for much of the explosive Protestant growth in this predominantly Orthodox country. What began as a small student movement in the 1960s has spawned a number of large Pentecostal denominations, with an estimated total of up to 2 million adherents. Moreover, Pentecostal theology and practices have spread to the mainline Protestant churches with the exception of only a few minor ones. A church service in the Lutheran Mekane Yesus Church or the Baptist Kale Heywet Church is often indistinguishable from a Pentecostal one, and all of the large Protestant denominations have accommodated Pentecostal positions and practices in their theology and liturgy. 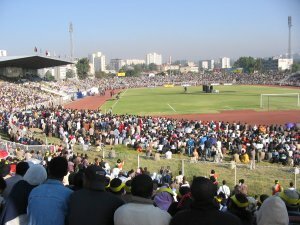 It is therefore safe to conclude that the vast majority of the 13.7 million Evangelicals in Ethiopia – that is 18.6% of the population – are part of a Pentecostal/Charismatic network. Even the Ethiopian Orthodox Church has been affected by Charismatic groups in recent years, mostly in the form of house fellowships. This tremendous shift within Ethiopia’s Christianity has hardly been addressed by academic publications in the past. The following pages document a recent PhD project on Ethiopian Pentecostalism and provide some reference material about the movement. "Theorizing Pentecostal Historiography: Persecution and Historical Memory in Ethiopia," in PentecoStudies. 11/2 (2012): 171–191. (with Terje Østebø) "EPRDF's Revolutionary Democracy and Religious Plurality. Islam and Christianity in post-Derg Ethiopia," in Journal of Eastern African Studies. 5/4 (2011): 755-772. "Embodying the Spirit(s): Pentecostal Demonology and Deliverance Discourse in Ethiopia," in Ethnos. 76/4 (2011): 534-552. "Theorizing Pentecostal Historiography. Persecution and Historical Memory in Ethiopia," in PentecoStudies. 11/2 (2012): 171-191. "Historical Epistemology and Pentecostal Origins: History and Historiography in Ethiopian Pentecostalism," in: Pneuma. 35/3 (2013): 345-365. (with Emanuele Fantini) Special Issue of PentecoStudies (12/2): Pentecostalism in Ethiopia. Sheffield: Equinox, 2013.